26 year old ‘Homie’ is the second of seven brothers and sisters. Born on the Cambodia-Vietnam border, he and his family moved to a village on the outskirts of Phnom Penh when he was just five. Life was ok as a young child, he was not rich nor poor. Common in Cambodia, all families hid their money and goods in their home but when Homie was about 10 years old there was a fire that took his family home and all the money with it. Suddenly they were poor with no food to eat as their mother collected scraps of old rice to feed the seven children. He began going to school through an NGO and completed grades 3 – 9 before dropping out so he could pick up cans and shine shoes to earn money for the family. 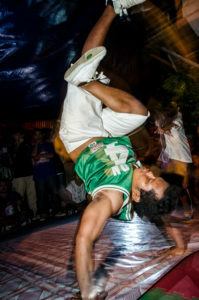 At this time he was also hanging out with “gangsters” in the parks of Phnom Penh, fighting and being rowdy. Soon their gangster activities escalated to drinking and stealing, but Homie never wanted a part in it. He refused to accept their stolen money and stopped hanging out with them by the time he was 15. 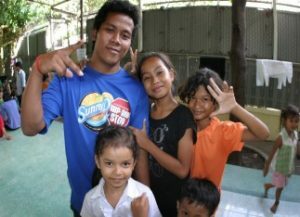 It was then that he met KK who was volunteering in a drug harm reduction centre in Homie’s village. Homie was enthralled by KK’s breakdancing skills and eventually joined the other children learning to dance in KK’s apartment. 7 years on and Homie is still dancing, working with the current Tiny Toones kids to provide them with a healthy and productive future! He has also finished high school and, with the help of Tiny Toones, is working on his university degree (business management). Check out Homie talking about his life and how Tiny Toones changed everything.